Banana lovers, this one's for you! 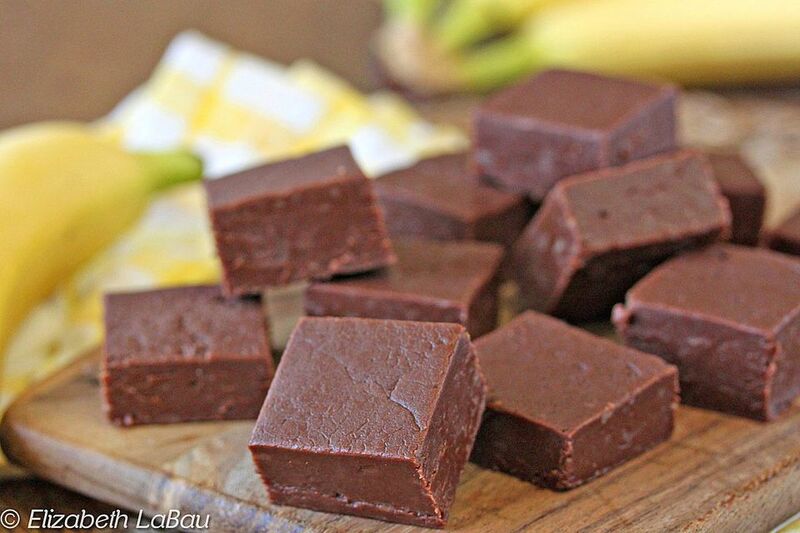 This rich, creamy chocolate banana fudge recipe has a real banana mixed right into the candy, so it has an authentic fresh banana taste that pairs perfectly with the deep chocolate. Best of all, this is an easy recipe that comes together quickly. Try adding chopped-up banana chips or peanuts if you want some crunch in your fudge! Line an 8x8-inch pan with foil and spray the foil with nonstick cooking spray. Pour the mashed banana into a measuring cup, and add enough whole milk to the cup to equal 3/4 cups of liquid. This will probably be around 1/2 cup of milk. Place the milk/banana mixture, sugar, and salt in a medium saucepan over medium-high heat, and stir until the sugar dissolves. Wash down the sides of the pan with a wet pastry brush to prevent sugar crystals from forming. Bring the mixture to a boil, and once boiling, insert a candy thermometer. Continue to cook the candy, stirring frequently to prevent scorching on the bottom, until it reaches 230° Fahrenheit (110°C) on the thermometer. Once at 230°F, remove the pan from the heat and add the chocolate, cubed butter, banana extract, and mini marshmallows. Stir until the chocolate, butter, and marshmallows melt and your mixture is completely smooth. Scrape the fudge into the prepared pan and smooth it into an even layer. Let the fudge cool and set at room temperature overnight, or in the refrigerator for at least 3 hours. When set, remove the fudge and peel off the foil backing. Use a large sharp knife to cut the fudge into 1-inch pieces to serve. Wrap the fudge well and store it in an airtight container in the refrigerator for up to a month. For the best taste and texture, bring it to room temperature before serving. This Is the Best the Best Pecan Pie Fudge Recipe!